The London Telegraph just published a short diary by Lily Cole, covering her experience of Paris Haute Couture week. These 'model diaries' are great- Gemma Ward wrote a backstage diary for Australian Vogue a few months ago, and Hye Park just did one for Vogue Korea. I love hearing the details about couture apparel ("a heavy, dark-red velvet dress with a 22in corset, a coat which weighed 45kg, 6in heels and a solid crown"), the backstage environment ("damned eclectic: '60s chicks, pre-Raphaelite girls and what appeared to be pregnant brides all dancing around and pouting"), and of course, famous designers ("wonderfully kooky and sweet"). Read on here. 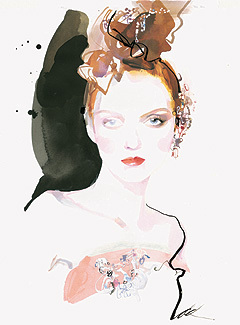 Lily Cole, above, as illustrated by the extraordinary David Downton. Posted by la femme at 1:48 p.m. Very interesting! I love Haute Couture shows! Thanks for posting. Very interesting to read. Sometimes hard to believe that these girls somehow are still little babies (going to school and stuff) and on the other hand travel that much, see so many things, get to know so many interesting people and seem even more mature than I am, although I'm nearly 10 years older than they (Lily and Gemma) are.